While I’m out on assignment, I thought I’d reprise this quick recipe, courtesy of Lynne Rossetto Kasper. 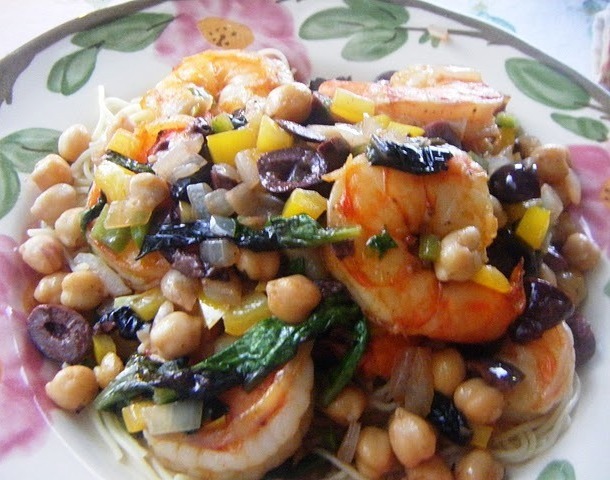 I’ve been making Lynne’s fabulous shrimp stir-fry for several years now, tweaking it on occasion by replacing the canned chickpeas with fresh-frozen chickpeas (garbanzo beans) — thawed with hot water then drained. You’ll find the recipe, in its entirety, right here. And yes, the quick-brining of the shrimp calls for 1/3-cup of chile powder, which isn’t too much, even though it sounds like a lot. I often make this when I find wild shrimp on sale. Sometimes I buy three pounds and freeze half, so I can make it again soon thereafter.